If you are working on a big spreadsheet and you would need some more space horizontally then you may consider hiding the vertical scroll bar because if there’s more data horizontally then you need to scroll horizontally which creates a hassle. So, here’s a quick tip that shows you how to hide vertical scroll bar in Excel 2010. 1. 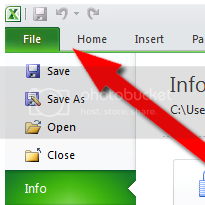 Click on the ‘File’ tab in the top ribbon. 2. Now click on the ‘Options’ button. 3. The ‘Excel Options’ dialog box appears. Click on Advanced on the left hand side. 4. On the right side, underneath ‘Display’, uncheck ‘Show vertical scroll bar’. 5. Click ‘OK’ to apple changes and close the box. That’s it! The vertical scroll bar should now be disabled and you should get some more room to work.